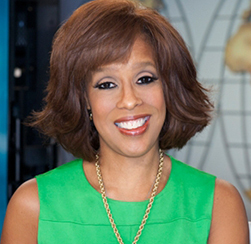 Gayle King, co-host of “CBS This Morning” and editor at large of O, the Oprah Magazine, will emcee the eighth annual Mirror Awards ceremony on June 4 in New York City. Hosted by the Newhouse School, the ceremony will include the presentation of seven juried journalism awards and two special awards. Follow on Twitter at #Mirrors14. King was named co-host of “CBS This Morning” in November 2011. She previously hosted “The Gayle King Show,” a live, weekday television interview program on OWN: The Oprah Winfrey Network that was also broadcast on XM Satellite Radio. In addition, she worked for 18 years as a television news anchor and hosted her own syndicated daytime program. King has received numerous awards, including three Emmys, the American Women in Radio & Television Gracie Award for Outstanding Radio Talk Show, the Individual Achievement Award for Host-Entertainment/Information and the New York Women in Communications’ Matrix Award. At the ceremony, David Zaslav, president and CEO of Discovery Communications, will receive the Fred Dressler Leadership Award. Walt Mossberg and Kara Swisher, who recently launched the independent technology news and reviews site Re/code, will receive the i-3 award for impact, innovation and influence. For more information about ticket and table sales for the ceremony, contact Sarah Hope at 315-443-5711 or mirror@syr.edu. For media inquiries, contact Wendy Loughlin at 315-443-2785 or wsloughl@syr.edu.